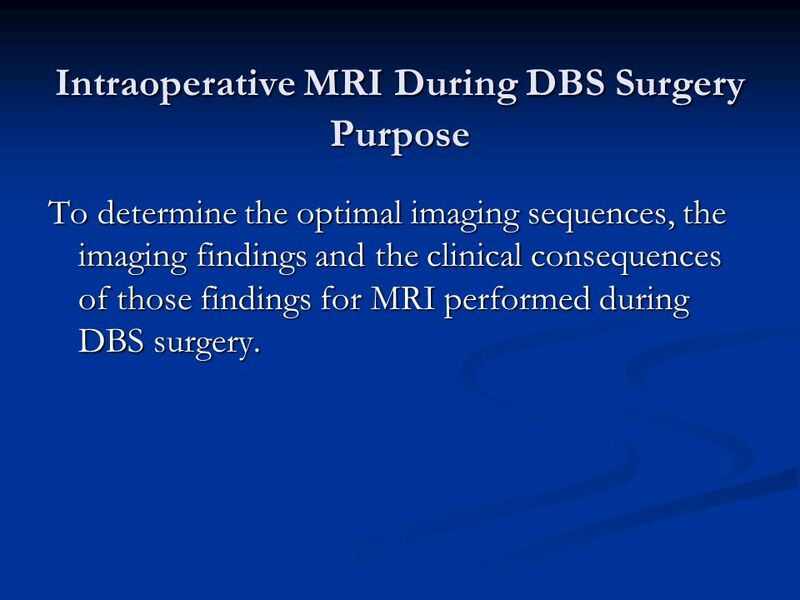 To determine the optimal imaging sequences, the imaging findings and the clinical consequences of those findings for MRI performed during DBS surgery. 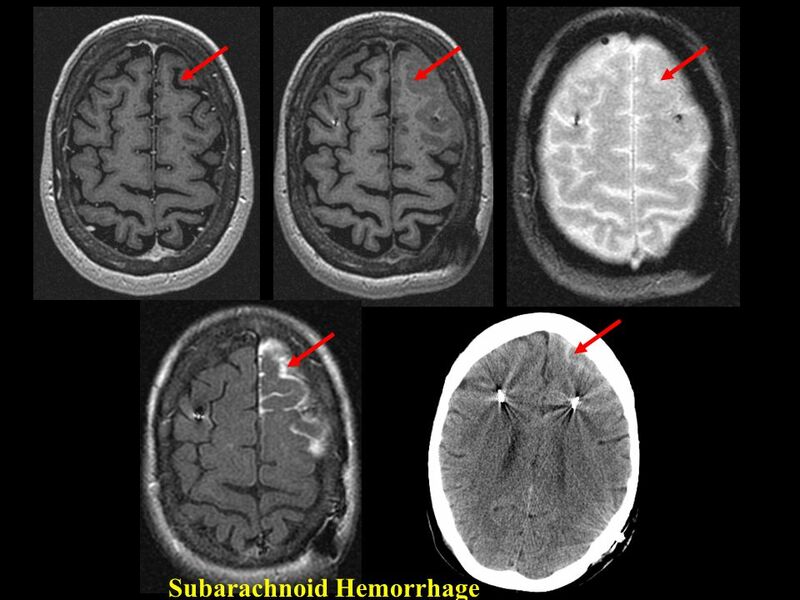 Intracranial hemorrhage is occasionally identified but is rarely clinically significant. 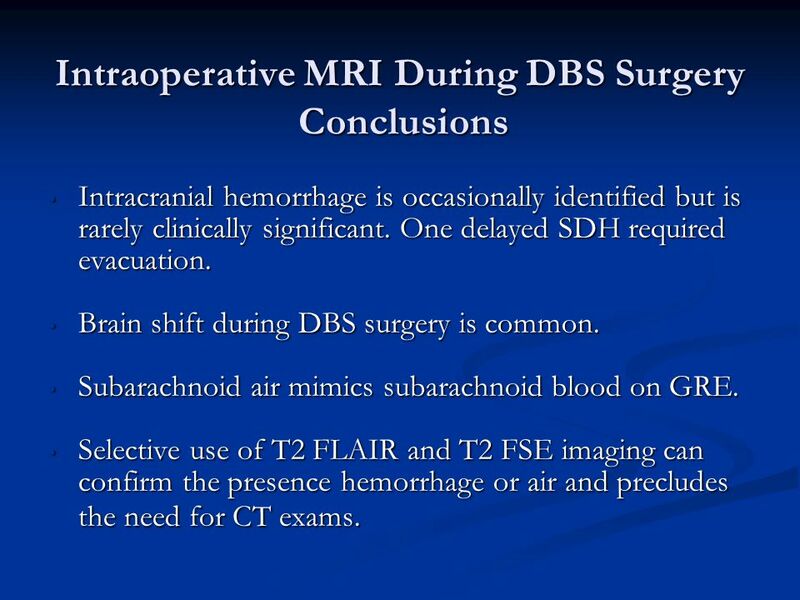 One delayed SDH required evacuation. 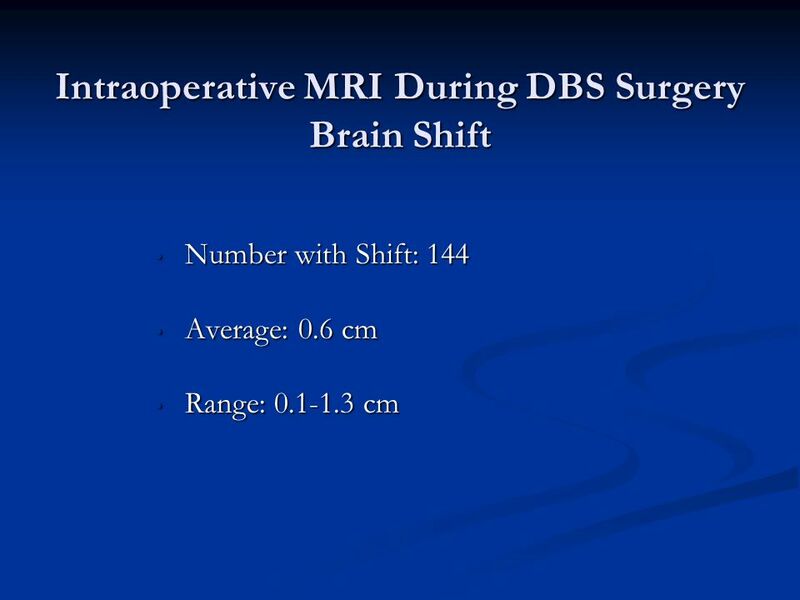 Brain shift during DBS surgery is common. 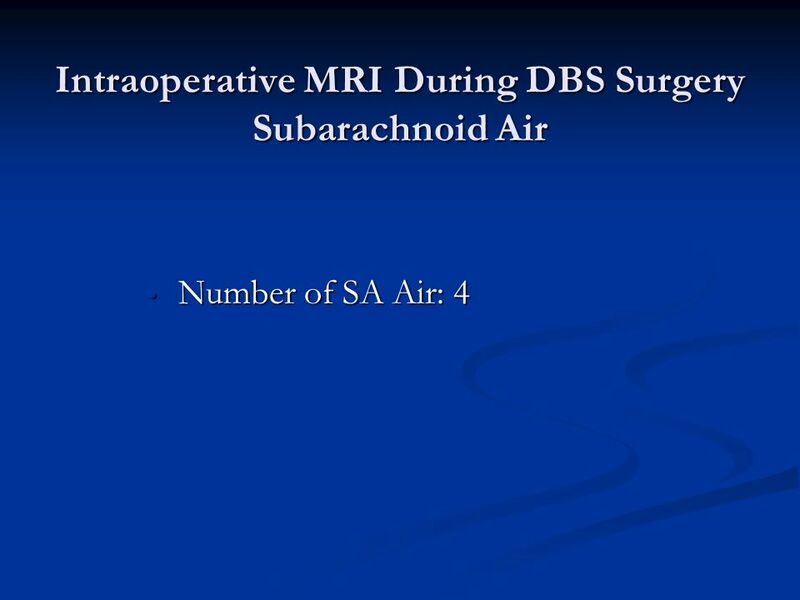 Subarachnoid air mimics subarachnoid blood on GRE. 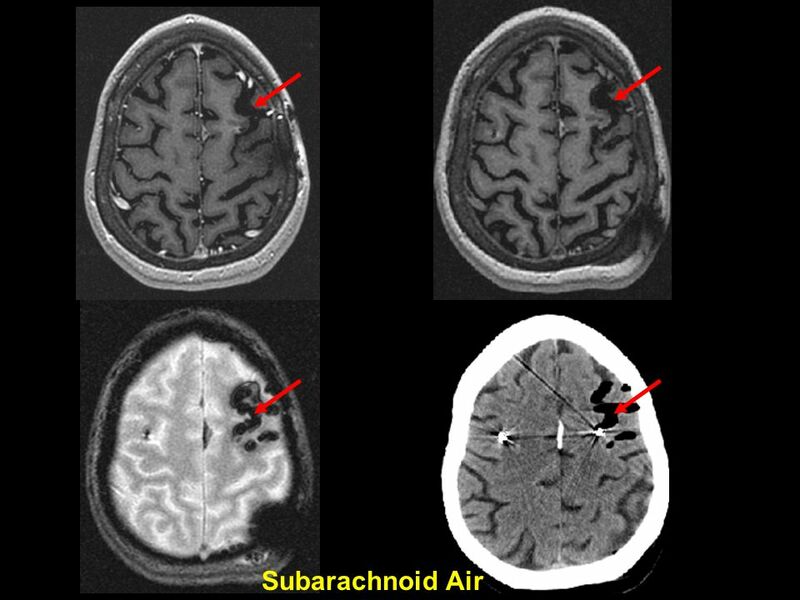 Selective use of T2 FLAIR and T2 FSE imaging can confirm the presence hemorrhage or air and precludes the need for CT exams. 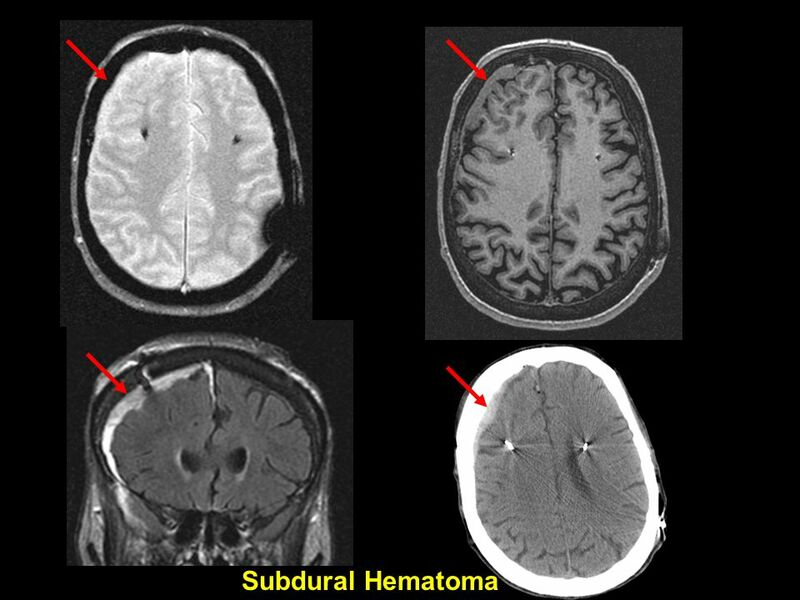 Download ppt "Olivia Huston Kendall Lee MD, PhD Robert Watson MD, PhD"
Cerebral hematoma as an initial presentation of focal cerebral vasculitis Fábio Carvalho (1); Mariana Santos (2); Cristina Gonçalves (1); Teresa Palma. 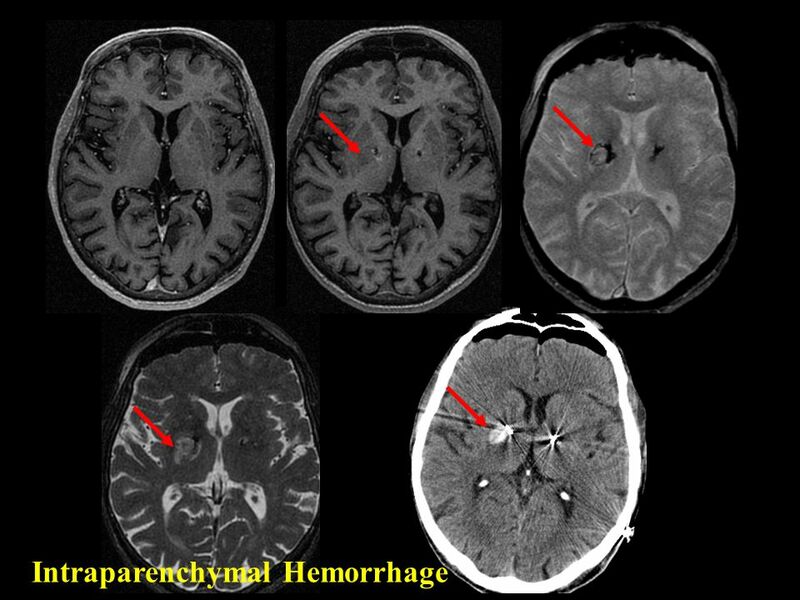 THE CLINICAL EFFICACY OF REPEAT BRAIN CT IN PATIENTS WITH TRAUMATIC INTRACRANIAL HAEMORRHAGE WITHIN 24 HRS AFTER BLUNT HEAD INJURY. Mallika Khwanmuang Phatcharapol Udomluck Jitsupa Litleangdej th year medical students. 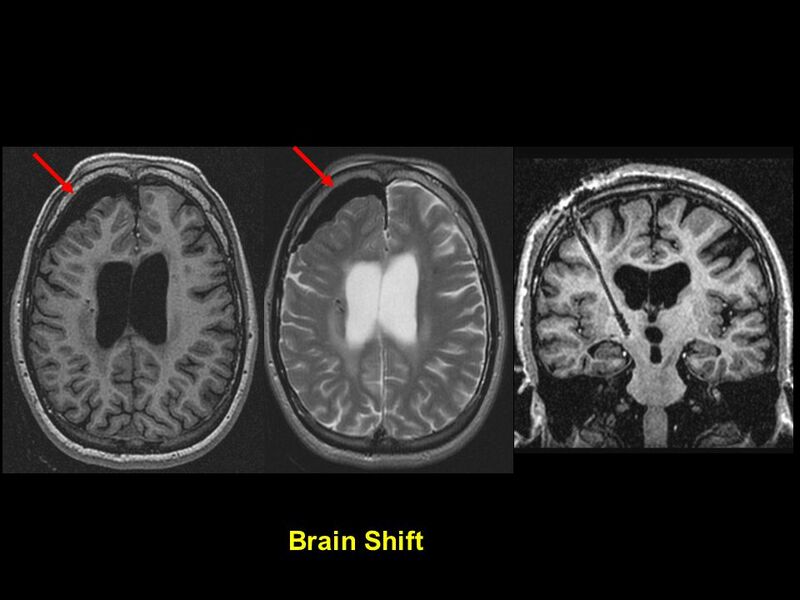 CT and MRI In elderly individuals Seyed Kazem Malakouti, MD Seyed Kazem Malakouti, MD Faculty of Iran University of Medical Sciences. Lower Gastrointestinal NET Clinical case One patient and how many doctors ? Dimitrios Dimitroulopoulos MD, PhD Consultant Gastroenterology Dpt. “Agios. 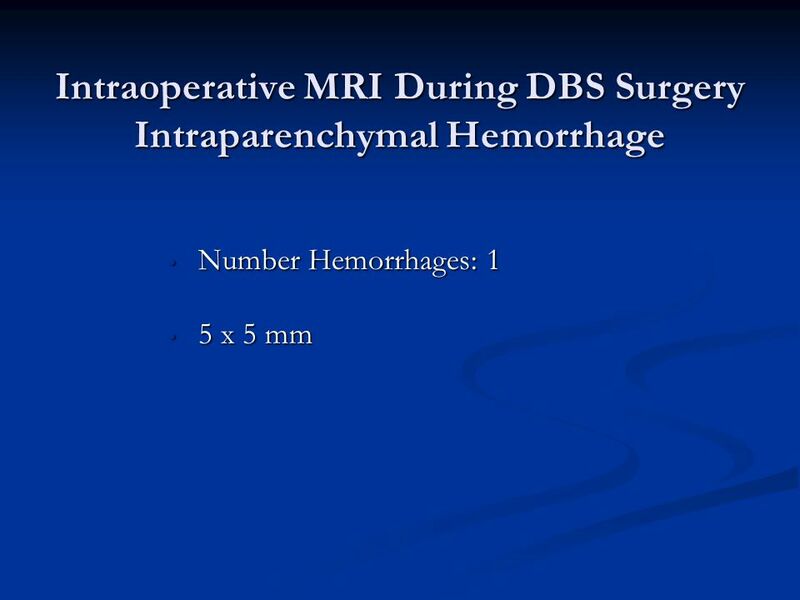 Complications of Deep Brain Stimulation: Risks of Placement vs Neurostimulator Device Issues Shahid M. Nimjee, MD, PhD Isaac O. Karikari, MD Tiffany R.
Impact of Autologous Platelet Rich Plasma Transfusion On Clinical Outcomes In Ascending Aortic Surgery With Deep Hypothermic Circulatory Arrest Cardiothoracic. 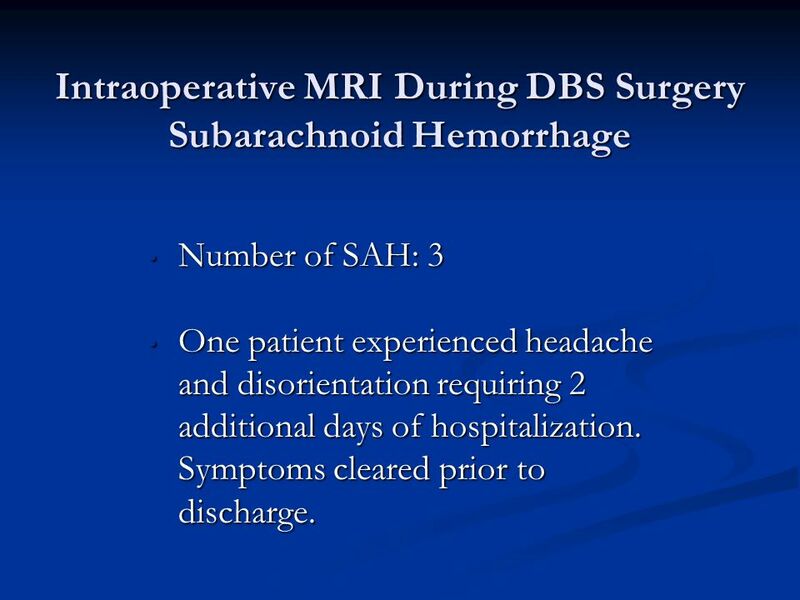 An Overview of Head Injury Management Eldad J. Hadar, M.D. 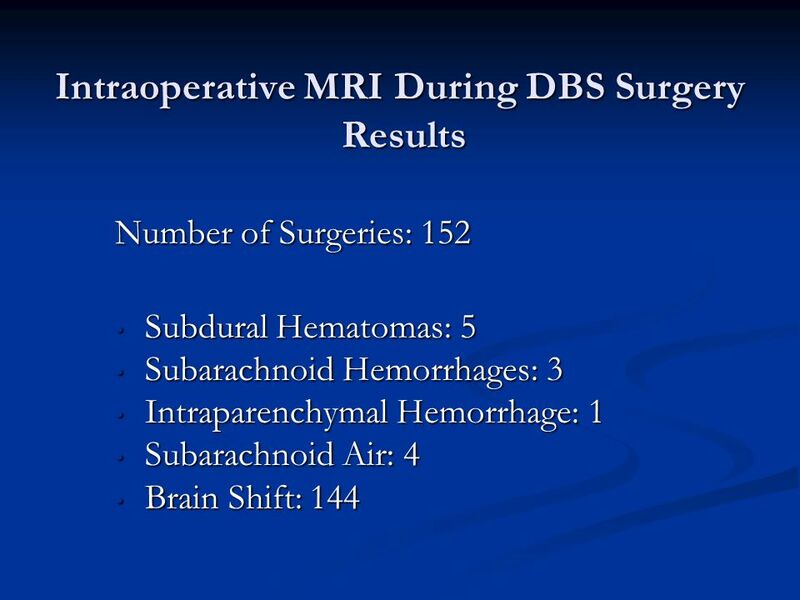 Department of Neurosurgery. 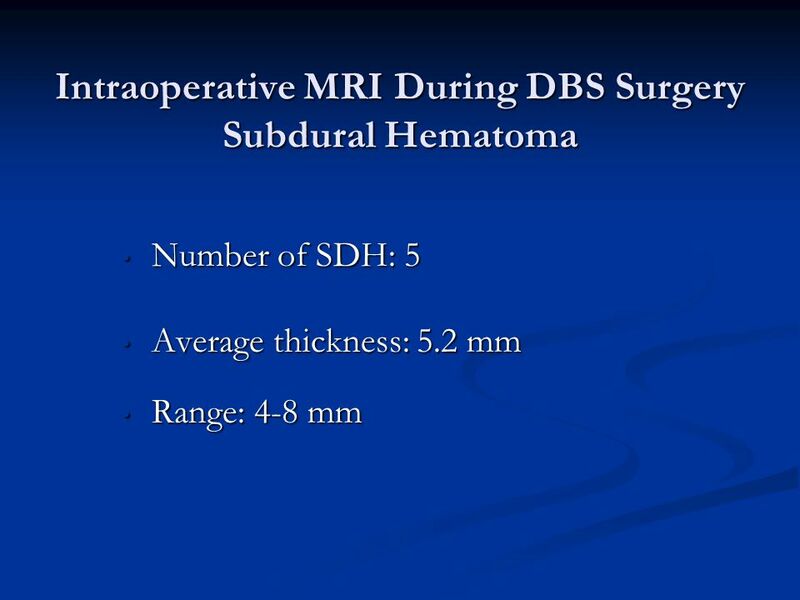 CHRONIC SUBDURAL HEMATOMA-CRANIOTOMY VS BURR HOLE TREPANATION. 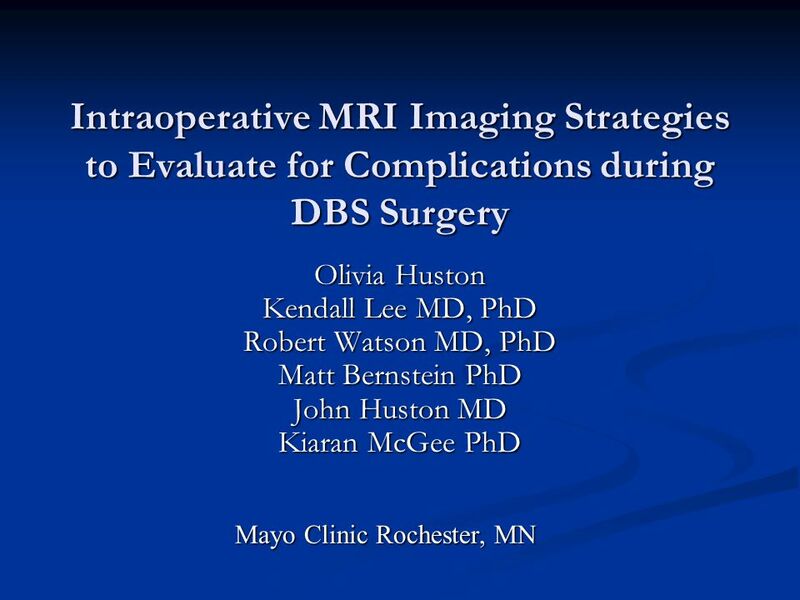 Author(s): Johnston, S Claiborne MD, PhD; Dowd, Christopher F. MD; Higashida, Randall T. MD; Lawton, Michael T. MD; Duckwiler, Gary R. MD; Gress, Daryl. 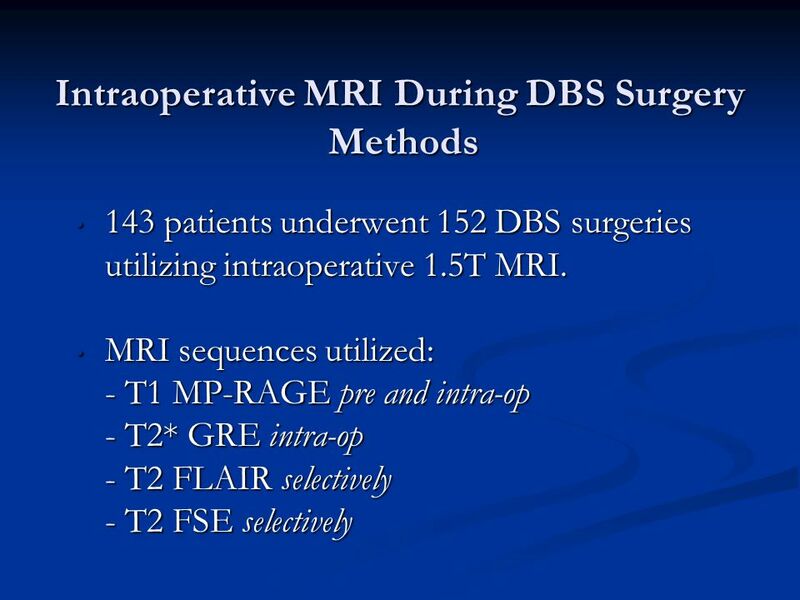 Andrew D. Schweitzer, MD 1 Jaspal R. Singh, MD 2 J. Levi Chazen, MD 1 Depts of Radiology 1 and Rehabilitation Medicine 2 New York Presbyterian Hospital.